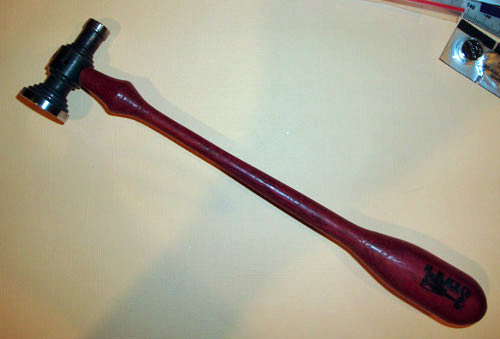 You are currently browsing the tag archive for the ‘Hammers’ tag. 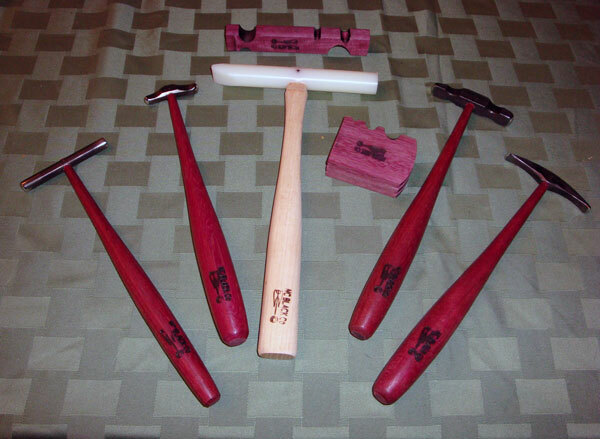 Check out my latest and greatest hammers and forming blocks from NC Black! This past Sunday, I was able to attend a demo by Andrea Kennington & Les Bryant of NC Black, which took place at Cottonwood Center for the Arts in Colorado Springs. As many of you know, I love tools. 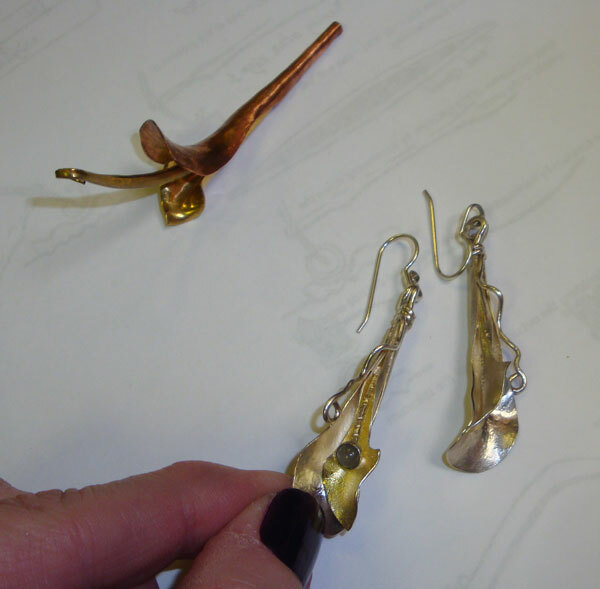 I have wanted to explore some additional metalworking techniques ever since Annie of NC Black did some demos at our Colorado Metalsmithing Conference this past July. Now I have what is considered a starter set of their mini forming tools and I will be practicing….a lot! The techniques that I will be exploring and learning are called shell forming: anticlastic raising and synclastic metal forming. Right now I’m not sure how I will incorporate these techniques in my work. I love learning new things. It is good for me to challenge myself and see how these techniques may be applied to my future works. Andrea is one of my Facebook friends, so it was great to meet her in person. She shared a number of things about herself and the company she formed, that added to my respect and admiration of her. I would like to share a bit of Andrea’s story. 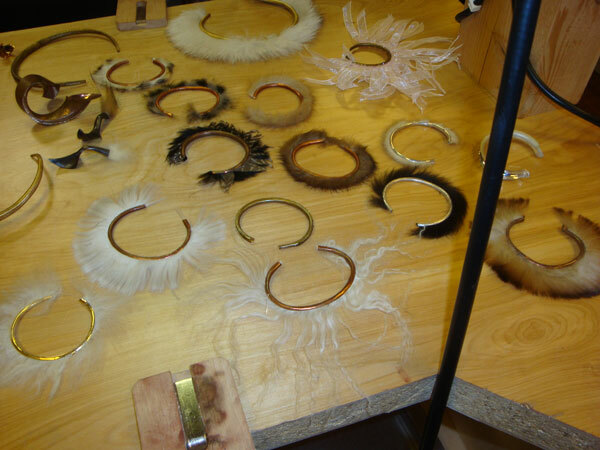 She apprenticed under Betty Helen Longhi and was a production jeweler for many years. She would teach a few workshops each year. For those workshops, she made the tools the students would need to use and those tools would be part of the student’s kit that they would take home after the workshop. She said she never set out to make hammers. She made a limited number of them each year for the workshops she taught. But demand for those tools increased and she really didn’t have the time, people or facility to produce hammers. That all changed…. When the economy took its toll on a few of her friends (they were laid off), that became the impetus for a partnership to form NC Black. The tool manufacturing company started 31 months ago and today employs around 18 people. Impressive. There is a direction that many artists in the United States are advocating and that is buy American made products. Andrea is supporting that cause with NC Black, using steel and wood from the US. Here are a few examples of the work Andrea and Les demonstrated for us. I shot a few video clips so I can refer back to them as I practice. I wanted to share this one as an example of one of the techniques they demonstrated. Next March, they will be back in Colorado Springs at the Cottonwood Center for the Arts to teach a workshop and I am ready to sign up. One of the encouraging things Les told us was that one could pick up these techniques in about 4 hours. Now, mastery of them comes with a ton of practice. We all have to start somewhere, right? I definitely like the quality of their tools. An added bonus for me is knowing the people behind the company. It was a pleasure Andrea and Les! Looking forward to spring 2012 when you return to Colorado Springs. I am an eager student. One of the vendors that joined us for the Colorado Metalsmithing Conference was NC Black Hammers. I have had my eye on their hammers for a while and at the conference I was able to watch demos, hold the different ones they had, and try to decide which one I wanted. As you can tell from the photo, I chose this beauty. 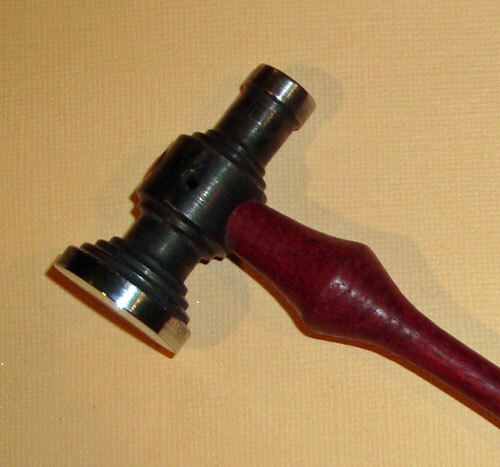 It’s called an Engraver’s Hammer. However, I’ve been using if for a few other metalworking functions in my studio. As silly as it may seem, I was particularly drawn to the way the head is shaped. Not only do these hammers have beauty, but more importantly, they have function. The one I purchased has wonderful weight and balance. I am happy I chose it. It also looks great with the rest of the hammers on the peg board above my bench. Again I need to thank my dad for instilling a deep appreciation for tools….good, quality tools. Annie Grimes Williams, of NC Black Hammers, did the bulk of the demos I saw. Not only was I impressed with Annie’s skill with the hammers, but her patience and friendliness were a real plus because there was no pressure to buy. I like that. The products spoke for themselves. Thanks Annie! During one of my many stops at their table, she was showing how to use their Micro Closing Hammer with their forming stakes as she was creating a nice copper bracelet. Fun to watch and of course, that Micro Closing Hammer with the Purple Heart Micro Forming Block have gone on my tool wish list. 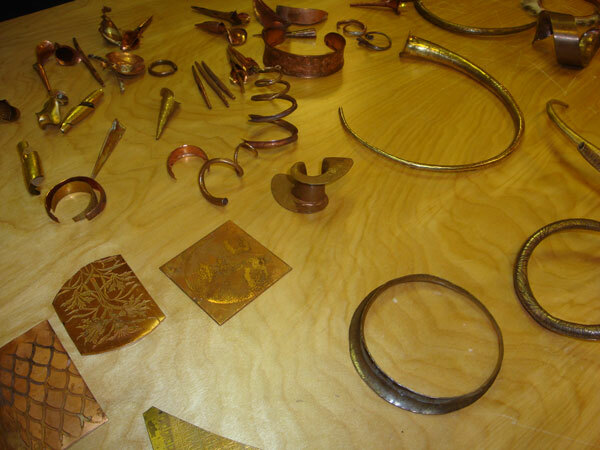 I imagine many of my metalsmithing friends are familiar with NC Black’s products. If you aren’t, I would definitely recommend trying one of their hammers. Great quality and value. Please take a moment to check out their Fan Page on Facebook too…you will see some pictures they took at the conference along with more info about their hammers and workshops.